Bogor Agricultural University (IPB) achieved Anugerah Keterbukaan Informasi Publik (KIP) / Endowment of Public Information Disclosure, Ranked III of the Category of University 2016. 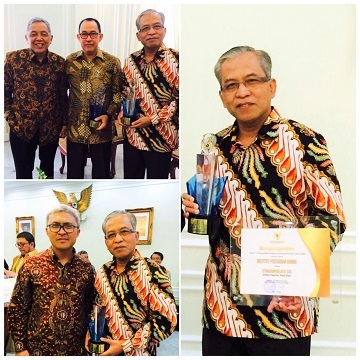 The award was given by the Vice President of RI, Jusuf Kalla, received by the Rector of IPB, Prof. Dr. Herry Suhardiyanto, at the Vice Presidential Palace, Tuesday (20/12). Chairman of the Public Information Commission, John Fresly, explained that this ranking was done through various stages. “The important thing that we convey in the presence of the Vice President is that with the time span of the monitoring for nine months, the data and the facts show that some public agencies must further demonstrate the commitment and the consistency in carrying out the mandate of the Act No. 14 of 2008 about the Public Information Disclosure” he said. He said, the things that were emphasized in the implementation of KIP in 2016, included the Commitment, the Coordination, the Communication, the Collaboration and the Consistency or i.e. about 5 KO. “This shows that the public information disclosure can not be executed instantaneously, but it must be a habbit for the public agency,” he explained.